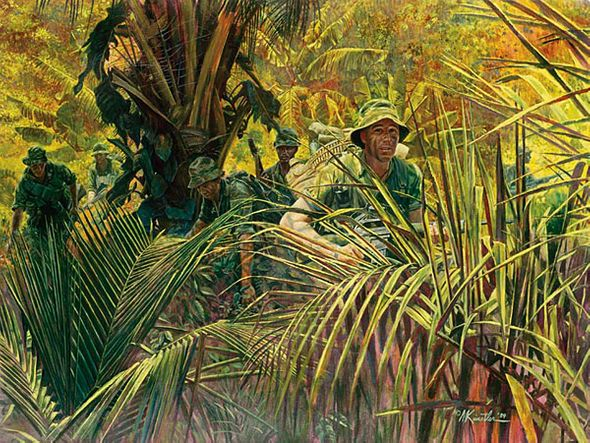 Mort Kunstler Handsigned and Numbered Limited Edition Giclee on Canvas:"Indiana Rangers: The Army Guard in Vietnam"
About the Art: On May 13, 1968, 12,234 Army National Guardsmen in 20 units from 17 states were mobilized for service during the Vietnam War. Company D (Ranger), 151st Infantry, Indiana Army National Guard arrived in Vietnam in December 1968. As part of the II Field Force, the Indiana Rangers engaged enemy units while conducting raids, ambushes and surveillance missions. "Delta Company" achieved an impressive combat record during its tour in Vietnam; unit members were awarded 510 medals for valor and service.